Boats were scattered and sunk at Dinner Key Marina in the Coconut Grove neighborhood of Miami after Irma hit the Florida Keys as a Category 4 storm. BIG PINE KEY, Fla. — We rolled down Hollerich Drive on Sept. 21, a swelteringly hot and sticky day, conspicuous not only because of the car emblazoned with BoatUS Catastrophe Response Team logos, but also because we were moving too quickly at about 7 mph. He saw me in the back seat with my iPhone and notebook. “Not from here,” he said, eyeing my hat. “Red Sox.” I nodded and stammered something meant to be an apology — in part for the dust, and in part because of my offending Boston ball cap. Scott Croft, vice president of public affairs for BoatUS, is shown near a catamaran the company insures. “Yes sir, I’m sorry about that,” said the driver, Scott Croft, vice president of public affairs with BoatUS. Riding shotgun is Bill Pike, executive editor with Soundings Trade Only sister publication Power & Motoryacht, who apologized too. The man nodded and turned back to his mountain of debris, and we continued down the road, crawling behind Capt. Kevin Freestone, owner of the Big Pine Key TowBoatUS franchise. The hammering, the growl of chain saws and the loud hum of generators drowned out any expletives we uttered while we took in the devastation. Residents were on rooftops patching or sorting through the wreckage. Piles of random items included a colander, a boat, a teddy bear, a washing machine and a chunk of metal roofing. American flags hung in front of or atop nearly every home, prioritized and replaced after the storm. Palm trees still had their fronds, but the mangroves were stripped, creating an eerie sense of winter on a 90-plus-degree day. We stopped near the end of the road, in view of the Gulf of Mexico and a canal, and got out of the car. Freestone told us about how he came here with equipment immediately after Irma struck, so people could access Big Pine Key’s only veterinarian. 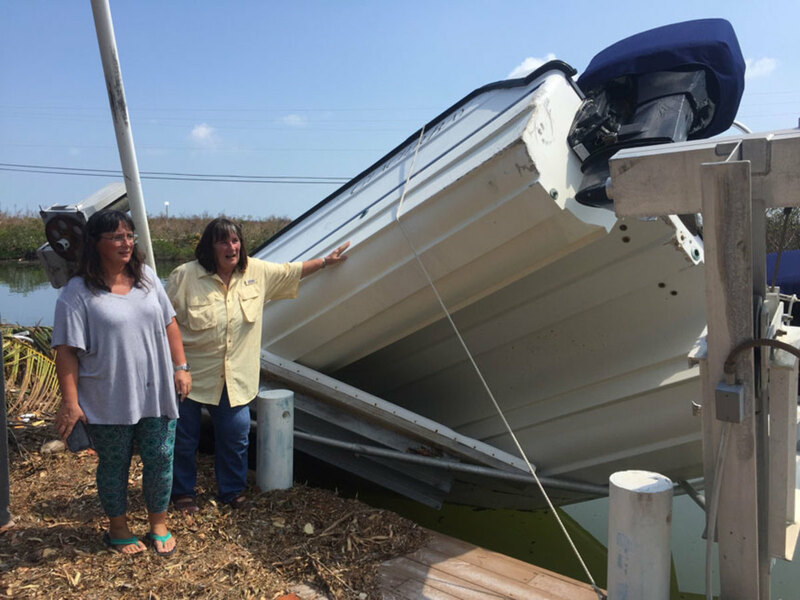 The home of Misty Klock and her boyfriend, Alan Cox, was badly damaged, but their boat weathered the storm. 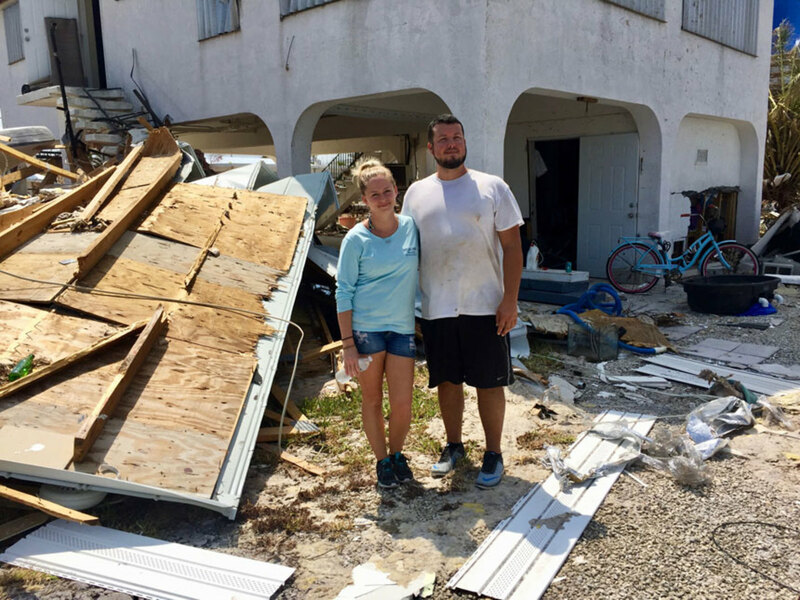 Nearby, Alan Cox and his girlfriend, Misty Klock, were cleaning up the mess that Irma made of their home, which had few walls left around the first story, like many of their neighbors’ homes. “Watch out for nails,” Cox said as we took in the damage, a warning that would be echoed at every home and business we visited. Klock amiably mentioned how nice the cross breeze was with the walls gone. “Do y’all want a cold water?” she asked. Pike and I paused, knowing that our South Beach hotel in Miami had flowing taps while Big Pine Key was without power and under a mandatory boil advisory. “No thanks,” I said, looking at everything Cox owns scattered around, some of it lodged beneath a yacht-sized chunk of her roof. Much of what was missing would never be recovered. Many of the 4,250 Big Pine Key residents we met referred to the things they had collected and built over a lifetime as “just stuff.” Except when it came to their boats. The boats were a top concern for residents here, ranking just below food, water and safety, and well above homes. “It was missing one cushion,” Klock said, laughing. Their neighbor appeared across the canal. “Hey, James! Did you just get here?” Cox called over. “Hey!” Klock called over. “We were wondering, did you have someone out to clean the bottom floor?” The entire first story of the neighbor’s house had no walls, making it look as if the house were on stilts. “Yeah, Irma!” James called back, and the three of them laughed. “We thought you must’ve had someone out because it’s so clean down there,” Klock said. She was right; not a single item was in what used to be the first floor of the neighbor’s home. “Irma’s a good sweeper!” he joked, and they all laughed again. “But she’s not a good boat keeper.” His boat had wound up far from where he’d trailered her. “You just let me know if you need any help moving anything,” Cox called over again. Another neighbor, John Evans, was outside looking at his Pathfinder 2200 Tournament, which sat sideways atop its trailer. Evans was relieved that the engine, a Yamaha 150 outboard, seemed undamaged. The Tiara was perched on the seawall across the canal, up against a home, one of three boats that wound up well away from where they’d been secured before the storm. “They had almost 10 feet of water here,” Freestone said. The national news had not prepared me for this. It focused on Key West, which wasn’t hit nearly as hard. We got back into the car, and I asked Croft whether we would be away from people for the next few minutes. “I’m just warning y’all because I’m gonna cry for a minute,” I said. It wasn’t the devastation, as awful as it was; it was the people worried about me taking a nail in the shoe, or being thirsty, when they had lost just about everything. A little while later, we were at the Sea Center, a marina on Big Pine Key. Zelko lost his barn, his home and the 17-foot Sea Hunt he self-insures and planned to fix. (He moved his horses to safety during the storm.) He also lost most of his tools — stuff he could’ve recovered, but that languished for days underwater. “They didn’t let people into the Keys,” he said. “I had access to a boat, but I couldn’t come in, so this stuff was sitting here rusting because you couldn’t touch it.” His Snap-on toolbox was rusted. The hand tools were OK, but the electric and power tools were a loss. Stacks of new Mercury outboards and BRP engines, all still in boxes, were ruined because the water covered them. Zelko had planned to go out on his friend’s boat that weekend, but they’d all been too busy. His horses, now back, would stay in the repaired barn, fixed quickly because a church and a construction company owner from Key West had helped. He’d go riding through some of the hidden trails on Big Pine over the Columbus Day weekend, and finally be out boating with friends. “Some people want to just get on their boats and disappear,” he said. 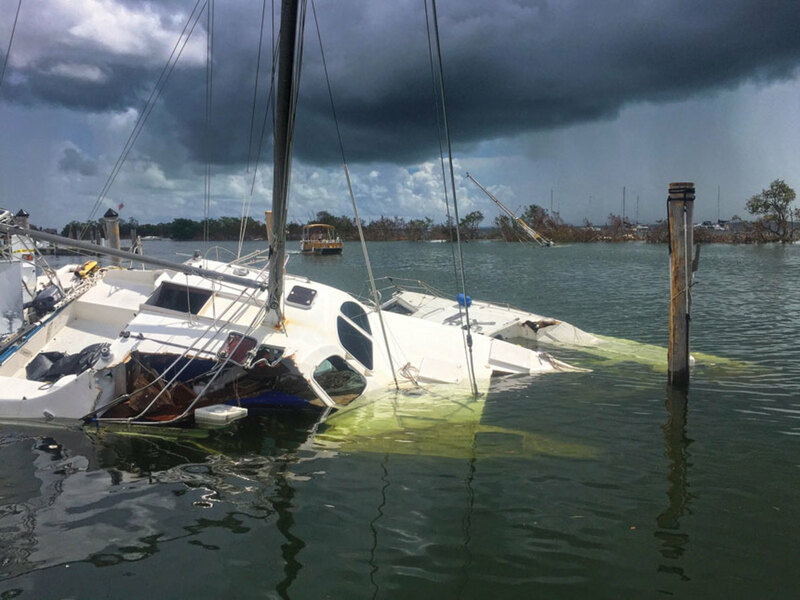 This sailboat is believed to have been on a mooring at the Dinner Key Mooring Field offshore of Dinner Key Marina before Irma hit. It ended up a total loss on the adjacent grounds of Carrolton School of the Sacred Heart in Coconut Grove. At West Cahill Court, Croft pulled over to ask two women where the Freestones’ house is. “You passed it up there a bit,” a woman named Carol Hawkins answered. She noticed the BoatUS logos and asked whether we wanted to see her half-sunken catamaran. She turned down the cold water I offered to her before anyone could ask us whether we needed some. They’d seen images of the property online and knew the boat was badly damaged, sticking up at an awkward angle from the canal. But seeing the hulls for the first time was something else. That boat is the tangible thing that keeps Hawkins connected to her late husband. It holds all the memories of the times they’d shared on board. Hawkins and her daughter assessed the lashing Irma doled out as Dydra fired up a chain saw to dismantle a palm tree that crashed into the home. “I was hoping there was no puncture to the sponson,” Hawkins said. Then, she saw the hole. And the engines, which clearly had been submerged. “I have a feeling she’s going to be OK,” Pike said. Debris was everywhere. Pieces of metal hung from trees. A neighbor asked whether the chunk of fence lying in the side yard belongs to him or to Hawkins. I spotted a medical insurance card from Louisiana. “Do you think Irma brought it all the way from Louisiana?” Pike asked. She sat next to the boat for the next 45 minutes. A little more than a week later, Big Pine Key was still “a war zone,” according to a Facebook post by Daniel Hutchinson. Nevertheless, Keys officials reopened the region to tourists Oct. 1. TowBoatUS co-owner Lisa Freestone, who is married to Kevin Freestone, did not share that sentiment. She thought local officials jumped the gun. Traveling to Key West by car, tourists had no choice but to go southwest from Miami Beach on A1A through Key Largo, Islamorada, Duck Key, Marathon and, last, Big Pine Key before crossing to Cudjoe Key, where the eye struck, and then Sugarloaf Key before reaching Key West. which saw stronger winds from Irma than any other place in the continental United States. Sustained speeds were 150 to 160 mph. The eye hit between Big Pine Key and Cudjoe Key, putting Big Pine in the storm’s nasty northwestern quadrant. “We rode the eye wall and had the worst winds,” Lisa Freestone said. In the more than 20 years that the Freestones have lived here, they’ve never seen anything like Irma. 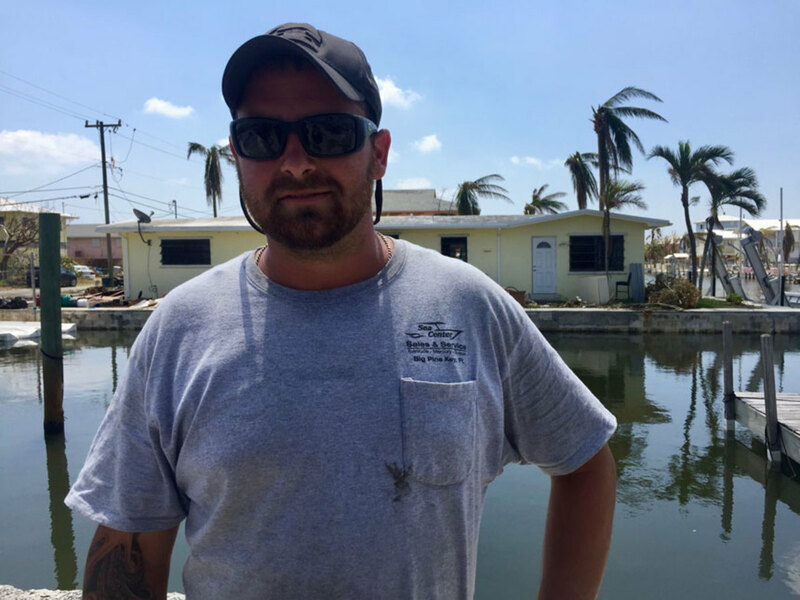 Shawn Zelko, who assists salvage operations with TowBoatUS on Big Pine Key, lost his home, his boat and his barn. Pike and I took a couple of stools at a South Beach bar with the BoatUS Catastrophe Response Team, or CAT team. Some of its nearly 50 members out salvaging and assessing damage had come directly from Texas, where they’d been working after Hurricane Harvey, and were on their 21st straight day. Sitting among about a dozen CAT team members, we tried to convey how much Carol Hawkins’ boat means to her. They listened and nodded. These guys had heard stories from 25 or 50 Carols a day for three weeks in a row. Every person has a story about her boat — what it means to her and why it’s so important. Going to assess boat damage is not like assessing a wrecked car. Boats seemed to count as much as pets do, at least around here. “People will get an emotional attachment to their boats,” added Tom Benton, also working on day 21. “And it only takes one boat to wipe out a whole marina,” Smith said. They slipped into memories of past catastrophes. As Croft said, each has its own personality. They’ve seen much worse than Irma — hard to fathom, but true. During their 10- or 12-hour days they’re salvors and counselors. Cleanup of the many sunken and battered boats was well underway when we got to Dinner Key Marina in Miami’s Coconut Grove neighborhood, but several hulls remained submerged. Sailboats were in the manmade mangroves, stripped bare and with masts sticking out from the waterline at awkward angles. 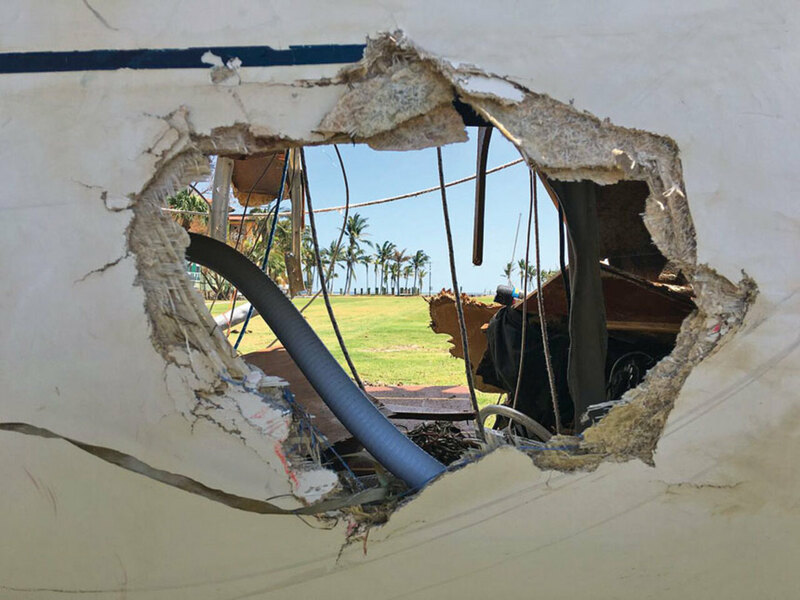 A 6-foot storm surge tore some boats loose from their pilings, and then 110-mph winds carried them away, creating what Croft called “a bowling ball effect” as they smashed into other vessels. Even boats that fared well had extensive damage to rubrails from battering pilings all day, but those owners felt they’d escaped the worst. Bob Patrick, 90, stood next to his 37-foot sailboat, unable to board because the dock leading to it had crumbled. Patrick, who owns Marine Specialties in Provincetown, Mass., had watched his boat on camera during the storm. On this day, he stood next to her for close to an hour until a squall came through and his wife gently persuaded him to leave the dock. Tracy and Michael Woodring, who live aboard their 1989 46-foot Nordhavn, said they also escaped the worst — a relief since Michael spent about 60 hours a week for the past year and a half doing upgrades that insurance wouldn’t cover. Carol Hawkins is shown with her 1999 Glacier Bay, which was still insured in her late husband’s name. Many of the 150 boats at the facility were in a jumble from storm surge that lifted and dropped them. A tornado hit Driftwood’s high-and-dry facility too. As of Oct. 4, the Freestones were still working to pull the insured boats. Next, they planned to work on derelict vessels. The CAT team expected to be in the Keys for salvage and recovery until the end of the month, Croft said. Croft did not think BoatUS would have a handle on the losses that Harvey and Irma inflicted until early November at the earliest, and he said the total will be tallied for the combined storms. That staggering number was compounded by the fact that only about half of all registered boats carry any type of insurance, Croft said. There are three ways to cover a boat: hull coverage, liability coverage or self-insuring, which basically means the owner picks up the tab for any damage. Hull coverage pays owners back if the boat is lost and covers repairs; liability pays for recovering the boat and getting it back onto the water, with owners paying for repairs. Self-insurance is what it sounds like: Owners are on the hook for everything. Liability coverage is a smart choice for most boat owners, Croft said, because recovering a boat can be complicated after a big storm. When Irma tossed three boats from Dinner Key Marina onto a high school football field near Biscayne Bay, a boat in the end zone cost thousands of dollars to “pick,” Croft said. Boat owners pay less than $100 a year for liability coverage, he said, versus the thousands of dollars it cost to remove that particular vessel. 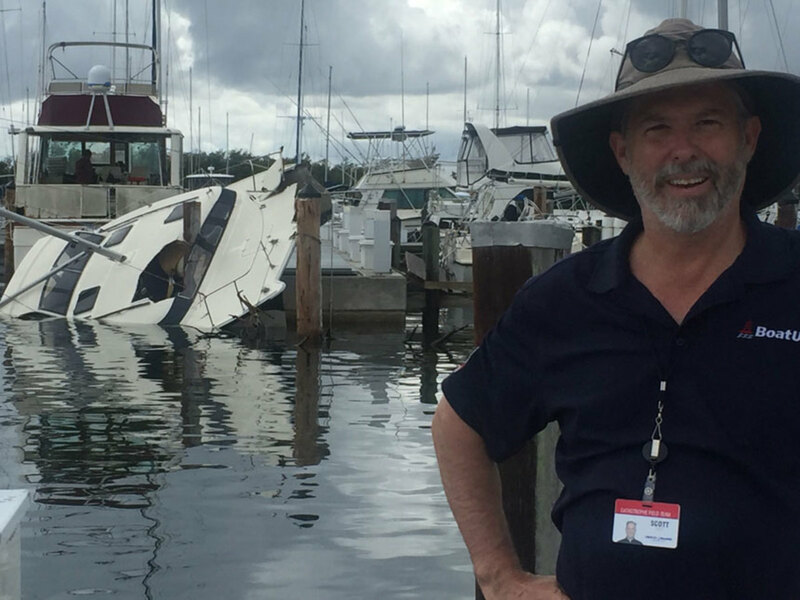 BoatUS CAT Team member Terry Hill assesses boat damage after Hurricane Irma. That’s especially true when considering what goes into the process of salvage and recovery. 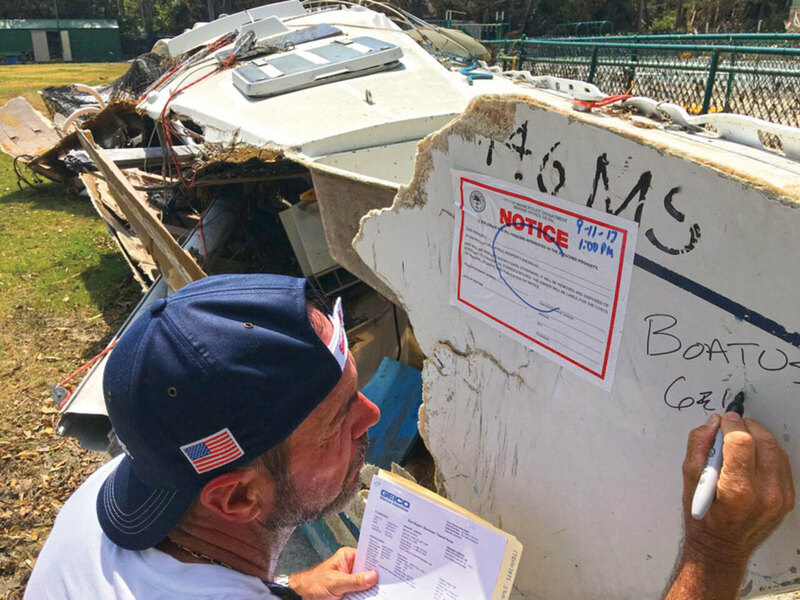 The process that BoatUS dubs “cradle to grave” includes assessing, removing and getting boats to their final destination, whether it’s a repair yard or a landfill. The process starts with how the boat will be removed, and what machinery is needed, from cranes and flatbeds to barges and chain saws. “Do we have to cut down trees? Do we have to remove six other boats before we get to our boat? And keep in mind, those six boats might not be our boats,” Croft said. Boats with liability coverage that can be repaired go to a liquidator, where the boat will later be sold, or to owners who foot the repair costs. Then there are the boats that go to a landfill. After they are recovered, they’re chopped up and loaded onto a barge or flatbed, with the engine blocks and hazardous materials being disposed of correctly. A crane with a crushing claw smashes what’s left. Each boat has a unique set of circumstances after a storm like Irma. Salvors sometimes need to be creative. 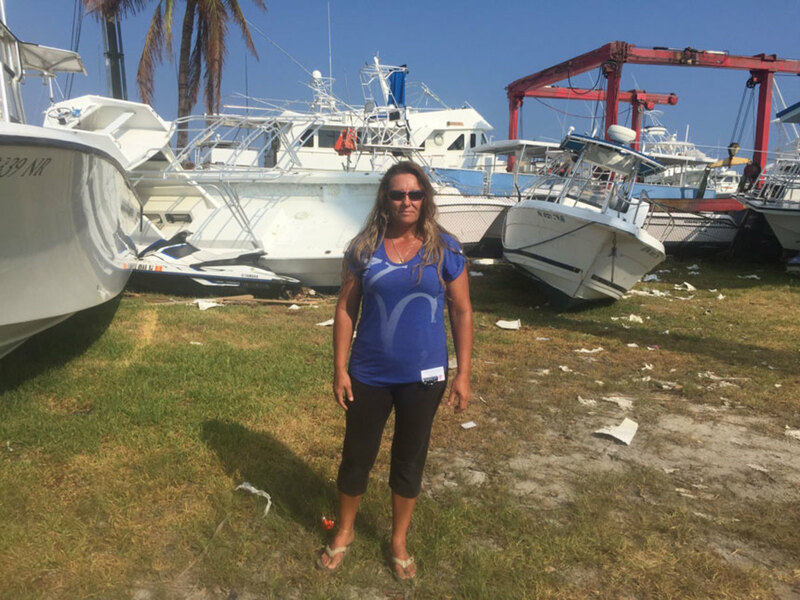 Shelly Breedlove, manager of Driftwood Marina and Storage in Marathon, Fla., is shown with a tangle of boats and debris. I reached Hawkins by phone as she was driving back to Big Pine on Oct. 6 from her Sarasota ranch. It was her first visit since the initial one, and she said she was ultimately lucky even though her boat was totaled. She had bought it back from BoatUS and was planning repairs. You can’t buy a boat like hers anymore, she said. Hawkins, her husband and their daughter spent years dolphin fishing on her. Much of the property, like the boat, is still in her late husband’s name. She has meant to change things, but has been “glazed over” since he died. A tornado struck her Sarasota cattle ranch in March, tossing the horses’ barn 12 feet away. Five days later, Florida Power & Light Co. accidentally set a fire, burning 15 acres of pasture. “It was in our bull pasture, and our bulls are so funny,” Hawkins said. “They’d sit there and watch it, and if it got close they’d finally get up and move and then lay back down and keep watching.